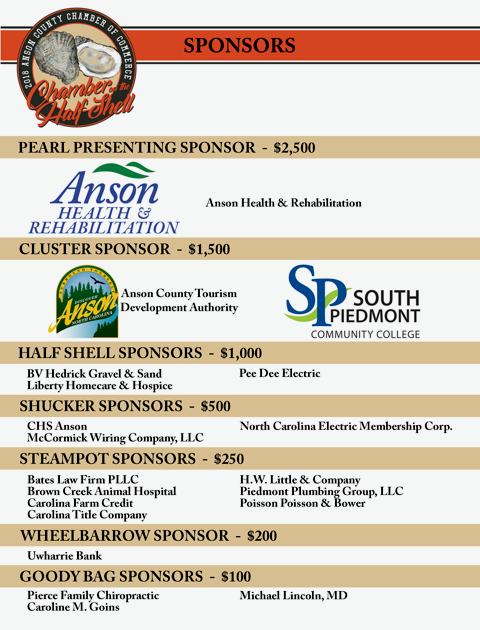 Thank you to the following sponsors of our upcoming event, Chamber on the Half Shell! Please be sure to thank the companies listed below, without their support this event would not be possible! Sponsorships are still available. Please contact Megan Sellers at msellers@ansoncountychamber.org for more information. We are excited to invite you to participate in the second annual Chamber on the Half Shell taking place on Saturday, September 29, 2018 at the Twin Valley Golf Club from 6:00 to 11:00 P.M. The Anson County Chamber of Commerce is a dynamic, energetic and respected business organization that facilitates both economic and social growth in support of our members and the community. The Chamber strives to provide quality community events for all members and residents of Anson County. Chamber on the Half Shell will be one of our most anticipated fundraisers of the year! Our fundraising goal for this event is $20,000. Become a sponsor – we have opportunities from $100 to $2,500. Donate a raffle item – we encourage you to be creative, items can range from your products and services, to gift certificates, baskets or experiences. Join us at the event! Chamber on the Half Shell will feature an all you can eat buffet complete with steamed oysters, fried shrimp, fried fish, hush puppies, coleslaw and all the fixings! There will also be a complimentary open bar complete with wine and beer to quench your thirst! And just in case you feel like dancing, The Live House Band will join us beginning at 7:00 P.M. to turn up the volume! Individual tickets: Chamber members $50; Non-Members $60 limited number of tickets available! In recognition of your generosity, your company will receive continued exposure with all of our sponsorship support levels. Thank you in advance for your generous support- with the strong support of sponsors and donors like you- we can meet our goal! Sponsorship details and a sign-up form are included with this letter. Please complete and return the form with payment immediately to ensure that you are included in all of Chamber on the Half Shell materials. If you have questions or would like more information about becoming a sponsor or donor for our 2018 Chamber on the Half Shell, please email the chamber at info@ansoncountychamber.org.